I have started working on The Kiddo's St. Patrick's gifts for her class. I must confess that all I really did was revisit her teacher gift for St. Patrick's Day from last year. For that post, see here. One of my readers mentioned awhile back that Pop Rocks were easier to find than rock candy, so hence the change. I made a little sleeve to go over a package of Pop Rocks. Of course, I got watermelon flavored ones for the green color. Just cut out the printable and fold and tape on the backside. Free-printable link for blog subscribers here. Personal-use only, please. 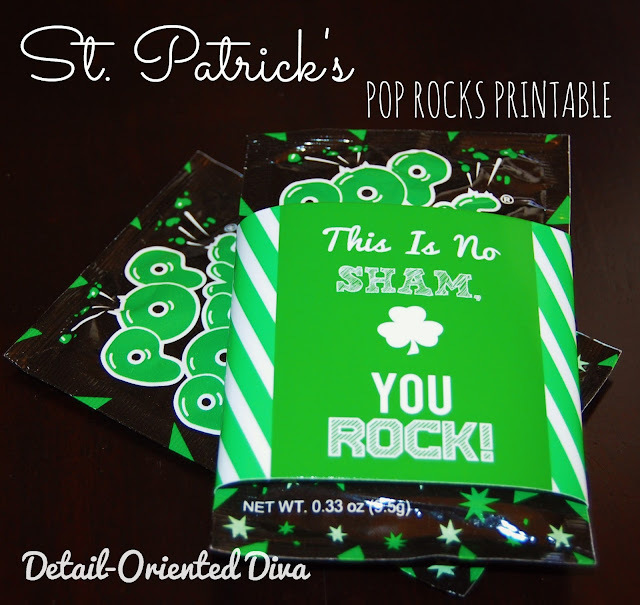 For more of my St. Patty's ideas click here.